The first thing that I noticed was that the braid I purchased was 3 ¾ oz, which surprised me, since most roving is put up in 4 oz bumps. However, upon discussion with Andrew, I checked it in grams, and it was 108g. 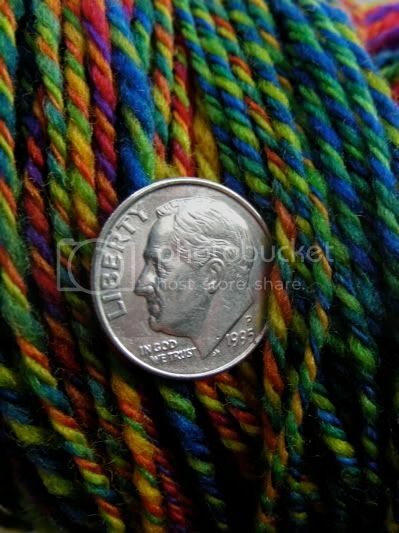 Enough for socks, but I’m a little miffed over being shorted- since I specifically asked if the braids were 4 oz. I really like how they dye their braids- in even lengths and weights so that if you’re inclined to line up the colors when you ply, it’s a little easier than Navajo-plying. The roving they use is pleasant to spin- not the nicest stuff I’ve ever spun, but a nice base roving nonetheless. The colors are very saturated and rich, which I love, and the yarn ends up just as vibrant as the roving. With the colors as saturated as they are, I was concerned about bleeding. I was pleasantly surprised to find that there was minimal bleeding (slightly pinkish) water after a thorough soaking. For the price and quality, it's a good buy, just make sure you're getting the right weight. I'll keep you posted as to whether this light bump was a fluke or if the others are light as well. 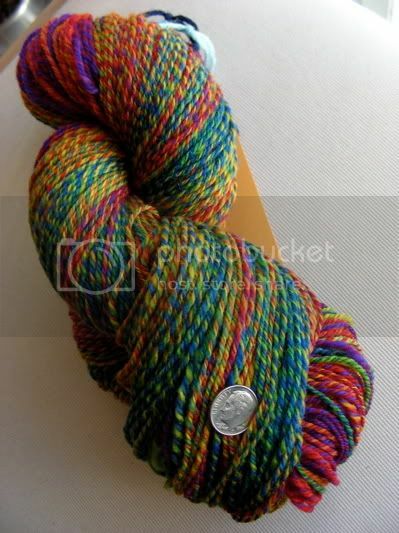 I like this better than the sock yarn in the same colorway. That's it, I'm spinning this weekend...you are amazing!